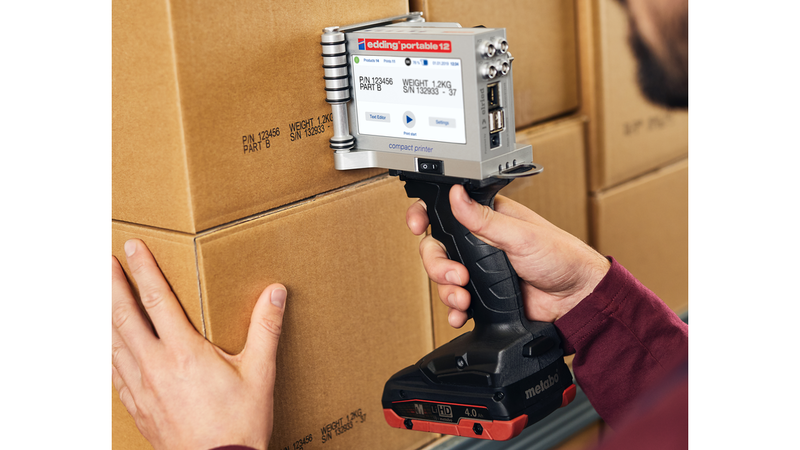 The edding portable 12 compact printer enables the redefinition of internal production and logistics processes. Combining the immense functionality of the in-line 12 printer with a positioning laser and industrial battery, the portable 12 compact printer is the perfect solution for industrial marking away from the production line. The 600 dpi high-resolution print engine enables you to to print barcodes, datamatrix codes, texts and logos. The cartridge system allows a color change within seconds while the Metabo LIHD battery with 4 Ah allows you to use the printer non-stop for up to six hours.